Beaujolais Nouveau is made from the Gamay grape and is typically bottled 6 to 8 weeks after harvest which is GOOD NEWS for those who can’t handle the tannins from aged wines – Nouveau typically has far less tannins. It is the first wine of the harvest, made to celebrate the harvest, but until WW II was kept at home for local consumption. For more information on Beaujolais Nouveau, go here. The first time I tried it, back in the 1980s when the wine world used to make a big fuss about Beaujolais Nouveau, it was the first wine I’d had that tasted like a fruity Kool Aid with a nice banana flavor to it. There are two offerings from Georges Deboeuf; one from inside the “controllee” of the Beaujolais region, and one from the surrounding villages (Beaujolais-Villages); unfortunately, I’ve only got the one from Georges Deboeuf. But I did find a pretender! 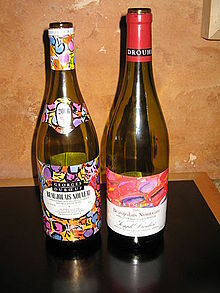 Below are two “Nouveau” wines. Oh, and remember this is NOT a wine to stock in your cellar (if you like it). Buy it, drink it! Do not let it age because trust me, age does not improve this wine. These are the 2006 bottles. On the Label: “The 2012 Georges Duboeuf Beaujolais Villages Nouveau, the first wine of the new vintage, has arrived! Time to enjoy and celebrate the harvest in style iwth this charming wine! My Take: It was better 30 years ago. That’s a knee-jerk reaction and I’m aware of that. But I didn’t get the light, fruity Kool Aid flavor I was hoping for; no banana taste. It had a heavier feel to it, which makes me wonder what this year’s vintage Beaujolais will taste like in a few years. However, it is inoffensive, not overly priced, and has a fun label that you can actually buy in tie form for that busy executive in your life. Trader Joe’s in California; $2.99 elsewhere. On the Label: The typical Government Warning and that’s about it. My Take: This bottling just made me laugh. I understand the reasoning behind it; they can’t put Beaujolais on the label – but to just toss a bunch of different grapes into a wine and decant it into bottles after a couple of months seems strange to me, even for Two Buck Chuck. The wine wasn’t bad, but it wasn’t a good red wine, either. My Rating: ~ Barely Drinkable ~ If it lands at your table somehow, add fruit to it and turn it into Sangria. You’ll be glad you did. However, others have different opinions on this wine. Go to Vivino.com and check out their ratings. This entry was posted in Wine Friday and tagged Beaujolais Nouveau, Charles Shaw, Gamay, Georges Deboeuf, Nouveau, Two Buck Chuck, Wine. Bookmark the permalink. I just love saying Beaujolais. 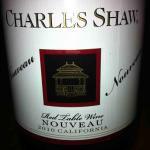 The Nouveau’s never been a favorite wine, but it’s usually a fun wine. Did you know that in 2001 over 1.1 million cases of the wine was destroyed due to lackluster sales? Ah the fun stuff one can find on the internet. Maria, I’m not surprised – the wine can’t stand up to age. It was the rarity value in the 80s that made it so fun. Back in the ’90’s, when hubs and I lived in NY, I was always drawn to the Georges Duboueuf Beaujolais Nouveau because the pretty, flowery label was like a cheap vacation from the gray skies and frozen rain I had to trudge through to get it. Funny how sometimes the weather was so bad I couldn’t make it to the dry cleaners, but I always made it to the wine shop!